The X-15 was a very unique test aircraft developed by the military and defense contractor North American Aviation Company in the late 1950s. It was an aircraft conceived after the development of the XLR-99 rocket motor for the Viking ICBM missile, producing 75,000 lbs of thrust. The goal was to make an aircraft that could go higher and faster than any had previously. North American built the X-15 with very high strength, though heavy, nickel alloy called Inconel X, the strongest usable metal at the time. (Titanium had not yet been developed for use in aircraft structures.) Control surfaces were of typical cruciform shape for low altitude function and hydrogen peroxide (inert gas) thrusters were installed in the nose and wings for yaw, pitch and roll control. The X-15 was carried under the starboard wing of a Boeing B-52 "mother ship" up to an altitude of 45,000 feet at 500 mph and dropped. The X-15's pilot then ignited the motor. Powered flight lasted 80-120 seconds and reached record speeds up to mach 6.7 (4,520mph) at 354,200 ft. - a world record that stood until the first shuttle flight in 1981. Flights usually took place over Utah where a 400-mile southerly no-fly corridor was allowed for the tests. The aircraft would then land at Muroc Dry Lake at Edwards Air Force Base in California ten minutes later. On November 5, 1959, X-15 number two (Serial No. 56-6671), fitted with a smaller engine because the XLR-99 was still under development, experienced an engine explosion after its drop from the B-52. Test pilot Scott Crossfield glided to a landing with a full load of highly explosive fuels, landing the crippled test aircraft. 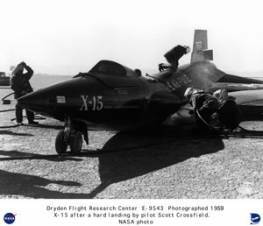 Due to the increased weight (since the fuel had not been burned off), the X-15 broke its back in the landing but Crossfield was uninjured. The aircraft was rebuilt and redesigned with a different canopy and longer fuselage to allow more fuel, returning to flight status as X-15-A2. The program lasted ten years and encompassed 199 flights, setting numerous speed and altitude records. The canopy from the second X-15, now on exhibit in the Museum's Modern Age Gallery, was donated to the Museum by Scott Crossfield himself in September 1993. Three X-15s were built. Crossfield's rebuilt X-15 is now at the National Museum of the United States Air Force in Dayton, Ohio. The first X-15 (56-6670) is at the National Air and Space Museum in Washington DC. The third aircraft was destroyed in a fatal accident with pilot Mike Adams at the controls in November 1967. Next to the X-15 canopy display is Crossfield's XMC-2-DC full pressure suit, manufactured by the David Clark Co. Crossfield personally helped develop the suit and it served as a prototype for those used by Mercury and Gemini astronauts. In this suit, he made his last X-15 flight on December 6, 1960 to an altitude of 53,374 ft and speed of Mach 2.85(1,881 mph). Crossfield eventually would fly the X-15 for thirteen flights and earned the coveted Astronaut wings. This artifact was donated by William Milliken.